Funny, contemplative and a showman; Russell has a presence on stage with multiple guitar solos and jokes in between sets. With the palate of an oenophile and a day job helping people pair wine and food, one might only guess at Stone’s abilities, unless you happened to hear a band he plays with—OC/DC, the Jello Boys, or the Monuments. His long fingers aren’t necessarily a clue, nor is his mind, which moves easily between Russian history, music trivia, reincarnation, and myriad other subjects. During his covers of Steely Dan or Beatles songs, you might pick up a thread of sitarist Ravi Shankar or keyboardist Bernie Worrell, both late, greats of their genres. Stone seems to channel—in his own way—the lineage of folk-blues-rock-funk and everything they grew out of and evolved into. Stone is the oldest in a four-sibling family that includes painter Matthew, guitarist Jonathan, and actress Megan. Jonathan says that they all got the “unconventional gene” from their father, a US Marine who taught himself carpentry. Their mother, a commercial graphic artist, moved the family in 1968 from the Berkshire foothills of Connecticut to Annapolis and worked for the Maryland Department of Natural Resources. His first instrument was a Gibson guitar, which his paternal grandfather bought because he enjoyed his daughter-in-law’s playing and singing. Over time, every child in the family played the instrument. Stone, who says he grew up in the parentally permissive “Dr. Spock” era, went to the movies and watched A Hard Days Night and Help again and again to understand what the Beatles were doing and began teasing those things out. He spent hours a day with the guitar, teaching himself. Despite all of his rock chops, Stone can’t be that guy who draws the crowds and plays loudly. “It’s just how I’m constituted,” he explains. But friend and Jello Boys guitarist Steve Badger says that, with one note, Stone can make a person laugh or cry. On stage with OC/DC on a cold January night at Stan & Joe’s South in Edgewater, Stone occasionally turns his back to the audience to play. He jokes to the crowd that it’s “British invasion sports night,” as the band is competing with the Eagles-Falcons football game as well as college basketball and football. But everyone is supportive and enthusiastic as Stone, A.J. Eckert (keyboard, guitar, and vocals), longtime friend Shep Tullier (bass and vocals), and Mickey Eckman (drums) dance back and forth across the Atlantic, starting stateside with Steely Dan’s “Do It Again” then moving to the Beatle’s “You Can’t Do That.” On the Kinks’ “Sunny Afternoon,” Stone sings and plays loosely yet is controlled before they transition to something bluesy and then to Barry White’s “Can’t Get Enough,” before taking a break. What comes across is someone who doesn’t take himself too seriously. 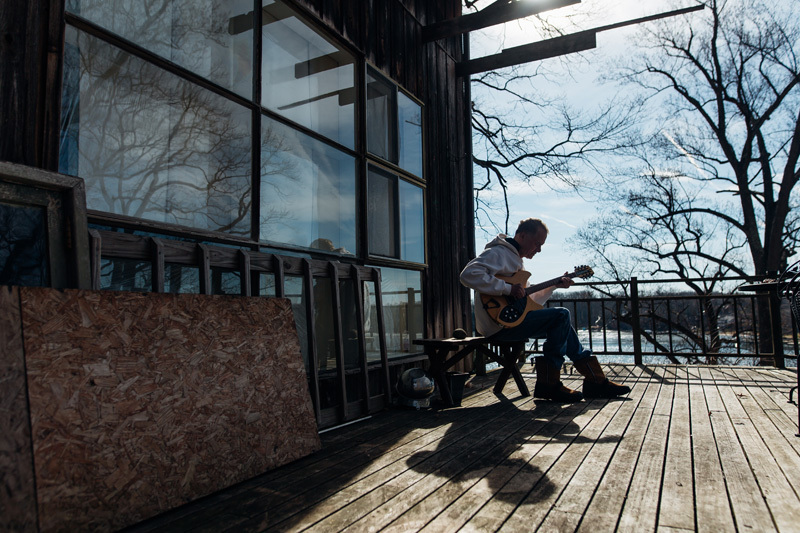 Stone says the guitar is a great spiritual barometer of whatever energies and influences are on the player’s side at any given moment, so the player approaches the instrument differently every time. That sensibility would probably conflict with a life on the road, having to play constantly and consistently, so Stone is glad he doesn’t make a living at music—though he has great respect for those who do. Russell likes to approach each song with a clean slate every time he plays them and he goes over “creative and spiritual hurdle” each time he plays. 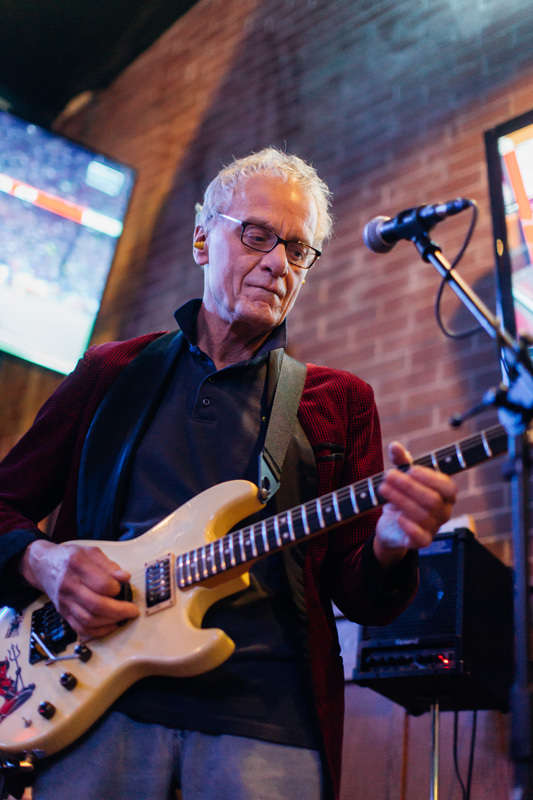 “I’ve never played with [Stone] where he’s repeated the same thing twice,” says blues guitarist Dean Rosenthal, who was maybe in junior high school when he first heard Stone play with Dirty Jane. “He’s very experimental in the way he comes at it—sometimes they work, sometimes they don’t, but it’s never stopped him.” For example, they could be playing a simple Willie Nelson song, and Stone will throw in a complex lick that reminds Rosenthal of Jeff Beck. Rosenthal also hears in Stone Adrian Belew and other guitarists who have their own way of doing things. “I don’t know how he hears what he hears. You realize that, when you take him in the band, he’ll push things further than you thought they were going to go,” says Rosenthal. Badger agrees: “[Stone] raises everybody up with his playing, encourages you to do more, find more, make the music happen.” He notes that Stone is always learning more about the art, science, and magic of music. Badger says that Stone has an ability to make the guitar sound like other instruments—flute, oboe, cello, keyboards, marimba, or clavinet. “He has got it tuned to the key of Russell,” he says. But Stone doesn’t want his friend’s comment taken too literally. “By accident or by intent,” he explains, “different tonality happens,” and it may be that, to someone’s ears, it resembles another instrument. 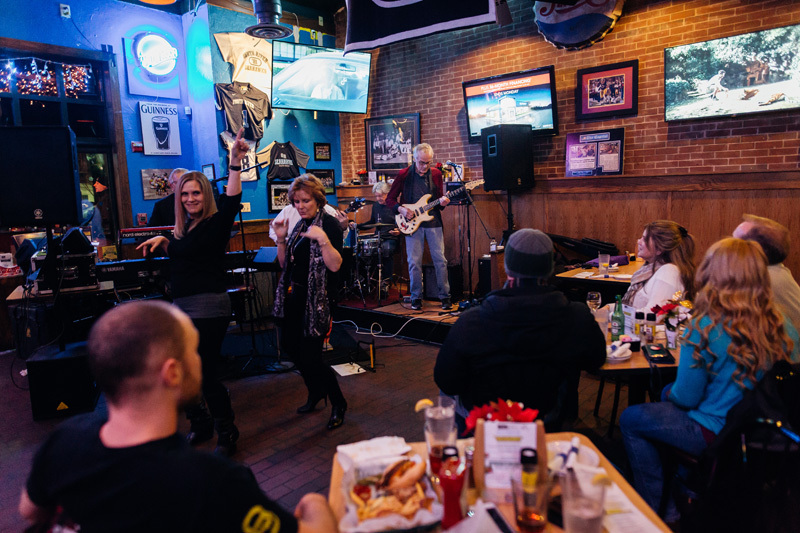 Large crowds come out to see the OCDC band play at Stan and Joe’s South on January 13, 2018. Russell Stone was born in Connecticut and moved to Annapolis in 1968. Started playing when he was 12 years old on his mother’s old “crummy” guitar as he calls it. “Sometimes I’m afraid to pick up the guitar because I don’t want to be disappointed,” Russel talks about trying to bring some thoughtfulness and something new to each set he plays. Russell Stone’s first guitar was a Gibson J-45 that his father bought him for $150 at the time. His father was really encouraging of his music and all the Stone siblings played guitar at some point. Shep Tullier (left) plays on the bass as Russell Stone talks to the crowd as the OCDC Band finishes their set at Stan and Joes South in Edgewater, Maryland on Saturday January 13, 2018. 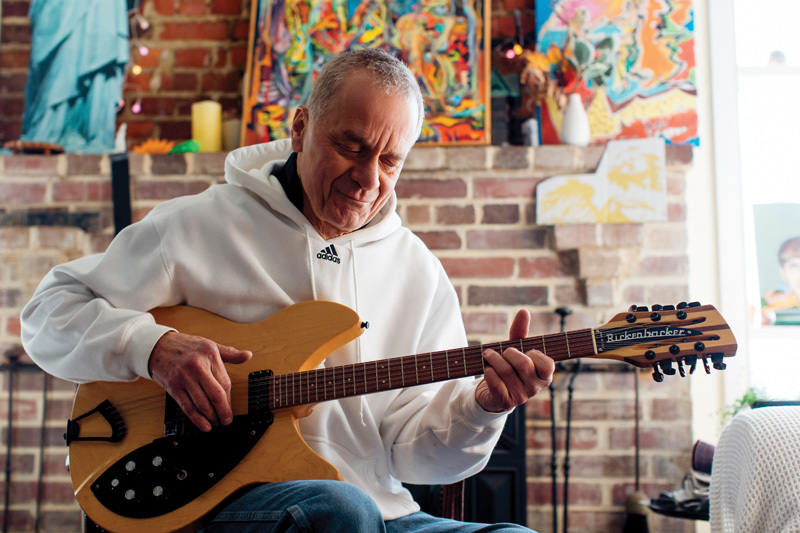 Russell Stone says that he sacrificed a higher education for his music because he went off playing in bands after he graduated from Annapolis High School. He likes to say that he “retired when he got out of high school” because he believed you could live an interesting life without having a regular job. Russell Stone is grateful for the chance to make music and has tremendous respect for people who make a living out of music. Russell Stone was born in Connecticut and moved to Annapolis when he was a young boy. He and his siblings have stayed here ever since. Russell Stone plays his twelve string guitar in front of some paintings by his brother Matt Stone in Annapolis, Maryland. Shep Tullier (left) plays on the bass and Russell Stone plays guitar as the OCDC Band finishes their set at Stan and Joes South in Edgewater, Maryland on Saturday January 13, 2018. Russell Stone has been making music for decades in Maryland playing with multiple bands and approaches every tune as a blank canvas. Russell describes himself as having a tendency to hibernate in his home and playing music there rather than at gigs. Shep from OCDC Band pulled him out of that to play regularly around Edgewater and Annapolis. Russell Stone poses in front of some paintings by his brother Matt Stone in Annapolis, Maryland. The song that convinced Russell Stone’s father to buy him his first guitar was “House of the Rising Sun” by The Animals. Russell Stone tunes his guitar while the OCDC band takes a break during their set at Stan and Joe’s South in Edgewater, Maryland on January 13, 2018. Error: Error validating access token: Session has expired on Saturday, 09-Mar-19 15:57:50 PST. The current time is Tuesday, 23-Apr-19 08:52:32 PDT.